In a season where many coaches emerged as candidates, Gregg Popovich captured his third Coach of the Year award from the NBA. This was a race where the voters couldn’t have gotten wrong with any number of selections. Tom Thibodeau, Dwane Casey, Jeff Hornacek, Steve Clifford, Terry Stotts all could have been named winners without much backlash. If there was ever a year where I wish a tie could have happened this is it. 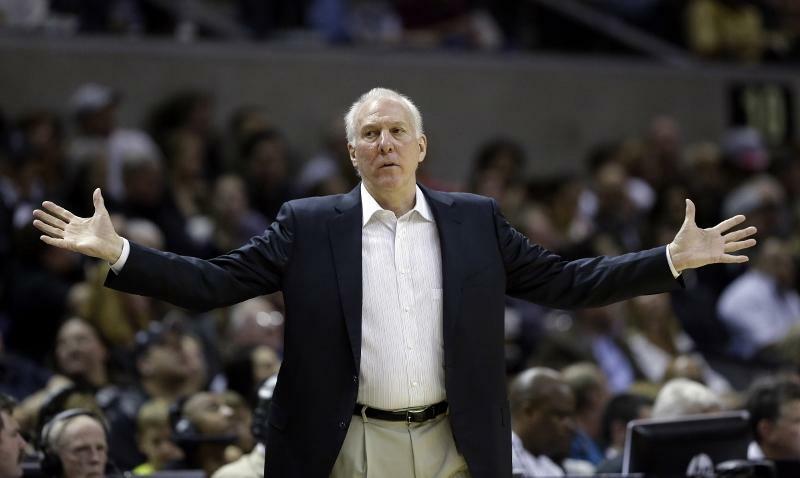 There are arguments FOR other great coaches but there are no arguments against Popovich. Death, Taxes, and Spurs. The San Antonio Spurs’ Gregg Popovich is the recipient of the Red Auerbach Trophy as the 2013-14 NBA Coach of the Year, the NBA announced today. Popovich’s Spurs posted the league’s best record at 62-20 (.756), which provides them with homecourt advantage throughout the postseason. Popovich, who wins his second NBA Coach of the Year award in the past three seasons and third of his career, joins Don Nelson and Pat Riley as the only coaches to receive the honor three times. He totaled 380 points, including 59 first-place votes, from a panel of 124 sportswriters and broadcasters throughout the United States and Canada. Coaches were awarded five points for each first-place vote, three points for each second-place vote and one point for each third-place vote. Can’t be mad at this selection as the Spurs won 62 games without even one player averaging over 30 minutes per game.